Before going to the event I noticed a link on the event page. I am did not see it before. So I may have missed it. The link was to Quirky’s NDA. I read it and it was simple, but strange that they would imply the use of this for this event. I have heard other people complaining about these NDA’s at events at the Makerbot offices. They require you to sign the NDA before you enter. At this event you did not sign anything, but the NDA was implied. I have no idea how Quirky could in force this, but anyway. We are here to hear peoples hardware startup stories. Of which I love to hear. 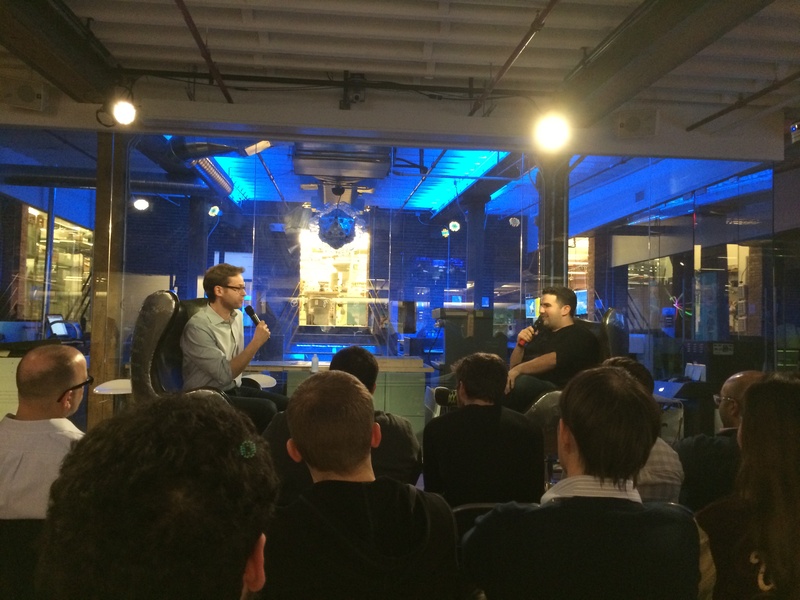 Brian Garret and Bram de Zwart, co-founder, 3D Hubs: 3D Hubs is world’s largest platform connecting 3D printer owners with people who want to print. We are on a mission to make 3D printing truly local and accessible. First up are the gents, Brian Garret and Bram de Zwart, from 3D Hubs. 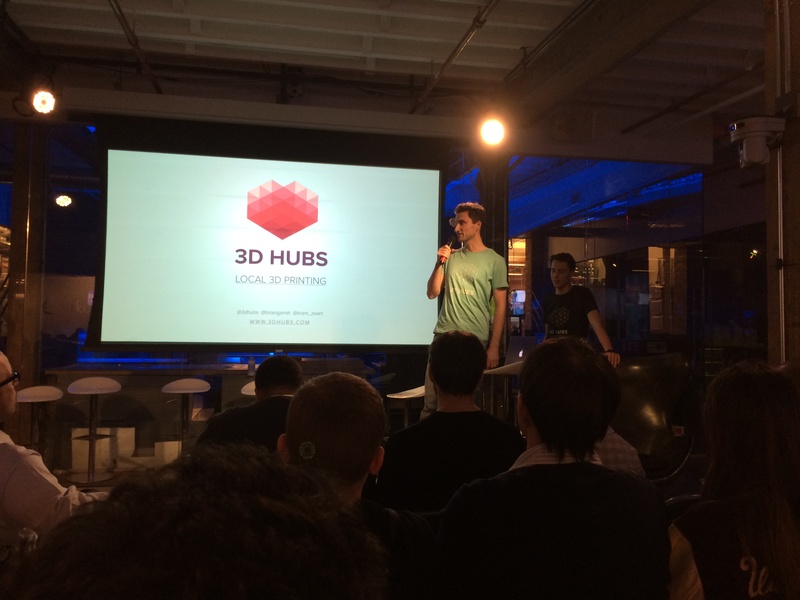 3D Hubs helps connect people that need something 3D printed to the people that have the 3D printers. They do this globally and by building a community of enthusiast that are in the know about 3D printing. They realized the need when they were working for Cubed. They saw that most 3D printers are idle about 98% of the time. Damn, that is a lot of idle time. I later asked them how long do you think it would take on average to use 3D Hubs to help pay for your 3D Printer itself. They said it was about 100 prints or about 2-3 months of constant use of 3D Hubs market place community. That is amazing. Makes me want to go out now and get a 3D printer now!! This could push me over the edge. I do own a Printrbot Simple, but I have not been liking it lately. Next up was Emile Petrone, founder and CEO of Tindie. Tindie is a market place for all things hardware and tech focused. An artisanal hardware market place. I have bought things on Tindie before. The interface is very simple and easy to use. He talked about how Tindie started. It started via a Reddit post. He asked the Reddit community about his business idea, got feedback and then knew he should try it out. If I remember correctly he mentioned he did a trial of this at an Apple WWDC event. Please correct me if I got this wrong here. Tindie does remind me of Etsy. The difference and similarity is that they both do products that focus on a type of product category. Handmade verus Artisanal Hardware. The value in this business is the audience (eyeballs) Tindie brings to their customers that setup a store front on the website. I am wondering though if after the uniqueness of this blows over what will they do to keep the eyeballs coming back. I hope they have thought of that. I love the idea of these market places. They give the maker-going-pro a place to tip their toes into ecommerce in a safe environment. The fabulous founder and CEO of Makie, Alice Taylor was up next. You have to love her. The Brits talk very smoothly and eloquently. Even with the jet lag she gave a great presentation. 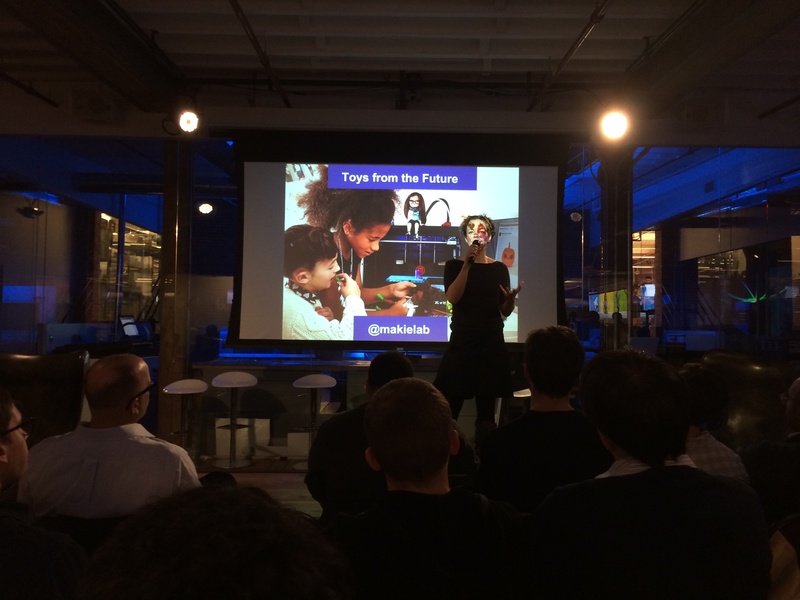 They make customizable 3D printed dolls for girls. I have hear very little of her company. I give them a lot of credit for entering into the toy business. Wow. Just wow. Their product is very very professional looking for a 3D printed product. I wonder, I forgot to ask, which 3D printer they use. Her presentation was a mix of how she got started and lessons learned. Their two revenue stream business is fascinating. They sell the customizable dolls and they are now starting to go into online gaming. Their first game is a dress up game. They may have a boy’s doll in the works. I know little about the toy business, of what I know is that it is a very hard business to break into. She has done it. I think it is cool that she has used 3D printing to create such a unique toy. The last presenter, before the interview with the CEO of Quirky was Hugo Fiennes, founder and CEO of Electric Imp. 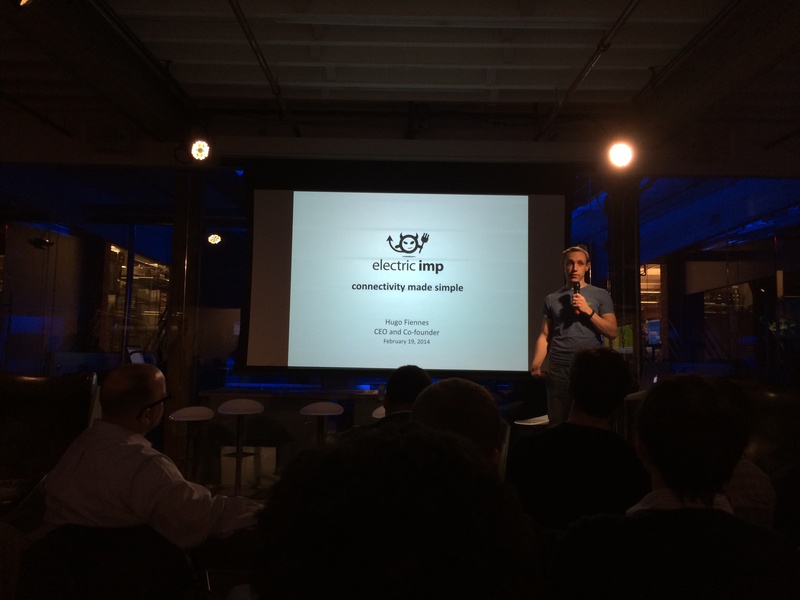 Electric Imp is a platform for IoT. I have heard of them before, but never heard his startup story. He worked at some very important companies like Apple, Nest and IBM as an Electrical Engineer. He started Electric Imp while he was working at Nest. The idea of having a platform for how smart things communicate over the web is brilliant. It makes the job of the electrical engineer easier. From my standpoint our customers will get an IoT product prototype quicker. However, the downside is when you want to go to production and scale to higher quantities. As the number of products increase the manufacturing cost don’t scale because you need to include the SD card package in your product. However if they can shrink it down to a chip package and manufacture that in large quantities the costs will definitely go down and scaling will happen. He mentioned they are looking into that. Quirky is a partner of theirs and uses the Electric Imp in their smart plug. Check out some of the pictures below in the gallery section of this post. In them he shows a diagram of how Electric Imp works. I like it. Again I would love to give it a try. The interview of Ben Kaufman Quirky Founder by Matt Turck was interesting. Ben’s story is one of those “it is great to not know anything and just jump right in” stories. Just do it as on your Nikes says Ben. The interview was a bit uncomfortable at one point as Ben mentions how FirstMark, the VC firm that Matt works at, screwed him. From what I see from Quirky’s fab offices, they are not hurting in the least. The Quirky offices are beautiful. The comments got some groans and laughs from the audience, but obviously you could feel the energy was a bit tense. Matt was great at continuing and asking Ben questions to get the interview on track. Some Ben did not answer. Ben did talk about the Quirky process of which everyone knows about. I do think it is interesting that Quirky has created a global manufacturing community in which they do all the product development and heavy lifting for the manufacturing process. They even do distribution. If you are a manufacturer you have to admire them. Ben has a sense of pride in that they treat the designer and IP maker as king. Quirky owns the IP and the designer has a forever license. This creates a lot of value for Quirky as they bare all the risk. I admire them, their capabilities, their relationships with GE and their retail distribution channels. Way to go Quirky!!! After the stage act was over the networking began. I saw a lot of old faces that I have gotten to know on the hardware scene. 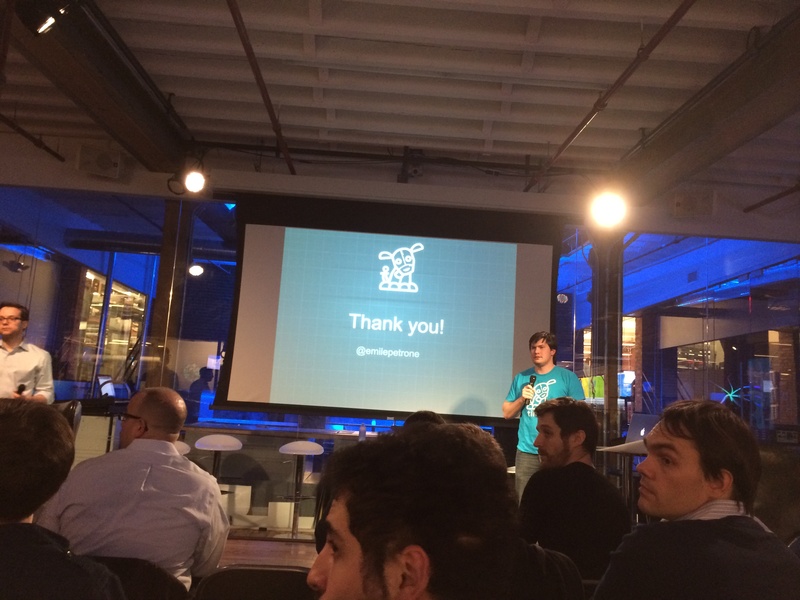 Until the next Hardwired NYC event. Check it out. I have more pictures of the event below. Sorry for the low light conditions, but you should be able to make out the slides and the speakers ok. I did my best to caption the images. Enjoy. Welcome to the Era of the Hardware Startup | LinkedIn. What I love about hardware startups is their willingness to take on and transform dauntingly complicated industries. Until recently, manufacturing had been almost exclusively the domain of big companies that can afford to build at scale. Now, these makers are turning the tables and showing the value of being both adaptable and close to your customers. I agree. From talking with many hardware startups the momentum is definitely there. I often talk about this as we are now where we were in the 80’s 90’s when software development and computing was transforming from being obtainable only by big companies with deep pockets to everyone who has a PC can now code to create a program that is of value. Hardware is very different than software. You can not develop a hardware product in a few days to a week. It takes time, patience, and more capital. It requires more relationships that last for a longer period of time. How do we make the product development process streamlined or lean? How do we integrate in design for manufacturability into the process from the beginning? Where is the book of the shelf that people can go to with out a degree in supply chain management to learn how to talk to the factory? And funding…Will funding for hardware startups get easier over time? There are a lot more questions to be asked and answered in this journey. I can’t cover them all here. In the future, I will write more about the process of hardware development. I am going to tell stories from the trenches. What happened, what didn’t, how we solved the issues and how to approach these things in the future so it does not happen to you. We have been seeing some great things from our clients. For most of them this is their first business. It is great to see them fill out their first Purchase Order ever. It is a great moment for them and for us. During the holiday break I found this post on TechCrunch that then lead me to this post. Before I go on about these two posts from TechCrunch, happy Thanksgivukkah to those that celebrate Thanksgiving and Hanukkah. This year both holidays happened at the same time. This will not happen again for several thousand years.I hope you enjoyed the convergence. Now back to the posts. I struggle with how to communicate the hardware development process better to startups I talk to. The way I do it is through a sort of lean approach. There is Lean Startup and now there is Lean Hardware. We use these terms too when we describe the process. Our process is very similar to what is stated in the post, but we emphasize DFM throughout the entire process. Right from the start we think of DFM, we do not wait. We integrate it in as the processes are happening at the same time, in real time. Very much like the Thanksgivukkah Holiday convergence. We also iterate on the problem, communicating with the client throughout the process. Each step may need feedback and may need to explain why a feature may cost differently than another. Usually our clients have a price point in mine or price is not the overriding factor. Quality is. Their target market has requirements. Integrating in DFM is essential for saving time and money. Also while encouraging quality of materials and design. The factory is truly a partner in the product development process. Do not treat them as a vendor. I can not say this enough. Yes, I think vendor is a dirty word. It describes a relationship that is distant and adversarial. The other day I was talking with a new prospective client. He was telling me how he hired someone to visit China, to visit factories and get quotes for his product. The product was not even ready to be quoted. It was not in the third stage of prototyping, it was in the second stage so the product was not in a finalized form. The BOM (Bill of Materials) was still changing. Not ready. So what happens when you go out and try to price a continuing changing target, you keep coming back asking for more information. This wastes both your time and the factories time. At the end, the factory will not want to deal with you. Or if they take you on you will not be on the top of the list of priority customers. We have seen this happen many times. The factory will get frustrated with the continued 20 questions game. Think of it this way, your product is not the only one the factory is being approached to build. Why should they take you on? Will you give them continued business in the future? The right way to approach this is to meet with the partner and see if you get along well. Why do it this way? Well, because you are not getting into a short term business arrangement. This is not like going into a store, buying something of the shelf and then you are done. Everything is custom. When you get along with your partner things happen a lot easier. You might say you are building tacit knowledge in this arrangement. As one of my clients put it, we are married and we are in it for the long haul. There are capital risks that the factories take on, such as construction of the assembly line. The factories want to have partnerships that last a long time so they can justify the added costs. Most of my business partners past clients have been with them for 10 years plus. So, avoid being the lookie loo. You will piss them off. Be a partner instead. You will not regret it.